Blog Why hand car wash is the best? Why hand car wash is the best? Do you have a car and every time you get it washed you freak out would it leave a scratch? Well that’s kind of obvious fear and it increases when it’s one of the luxurious vehicles. You can’t bear that risk of having a minor dent or screen scratch for doing cleaning. So, whenever the owners come at the car port, specialists don’t have the space for mistakes and thus pick up hand car wash. Car wash experts have often found the customers perplexed on what to choose between automatic and hand wash.
Hand car wash is an option to improve the car’s performance. A bright exterior with shining surface is an impressive way to run on the roads. It’s a defence to car from the debris and scraps and maintains the look as completely new. Hand car wash is a sensitive washing that takes care of the cuts and corners while automated is kind of rash and unconcerned. With a professional hand car wash you get a guaranteed no scratch cleaning and more of a fresh look. It prevents major illness by keeping the environment of car infection-free and devoid of germs. Busy schedule does not allow people to be regularly involved in cleaning this essential and convenient medium, car. The car ports in South Melbourne have thus come up with several schemes for people to acknowledge the importance of hand car wash.
Cars kind of become the second homes. It’s necessary that you keep it clean, neat and new. It’s only with the hand car wash that defects are known manually. It’s an effective treatment to uncover the smallest flaws. The overall hand car wash is a tiring and excruciating job. Also the cleaning essentials that you buy would cost you an arm and leg. So, allow the experts to involve in hand car wash.
Go online at https://carreracarwash.com.au/ and find what all we can do to help your car gain performance. The car ports in South Melbourne have come up with several schemes for people to acknowledge the importance of hand car wash.
Hand car wash is more promising and valuable. Most car wash ports in Melbourne have given an edge to the car’s finish with this manual handling and caring. It is no doubt better in every way, considering quality, efficiency and results. A clean car makes a lot difference in how you feel for your vehicle. As you drive, dirt and dust stick around the car which is hard to get rid of. This layering of dirt film can destroy the car’s finish. 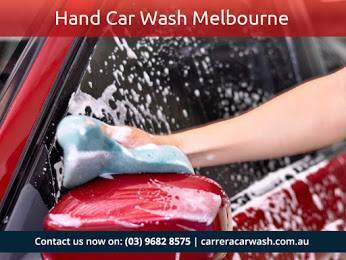 But fortunately, we operate on sincere and intense hand car wash in Melbourne and things are done precisely and neatly.